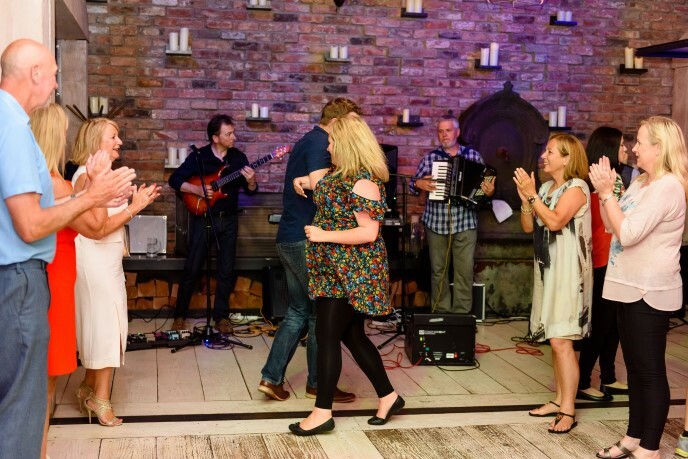 The Cutting Edge is one of Scotland’s liveliest Wedding and Ceilidh Bands and is the perfect entertainment for any special event playing a contemporary mix of rocky ceilidh dances with modern covers. We guarantee to fill the floor on every occasion. Weddings, Parties, Student and Corporate events are our specialty, playing all over the country from Aberdeen, Dundee, Edinburgh, Glasgow, Inverness, St. Andrews and everywhere in between. The Cutting Edge is available as a rocky 4 or 5 piece band or a 7 piece band featuring an awesome brass section. Yes, ceilidh dancing and R&B to a horn section! 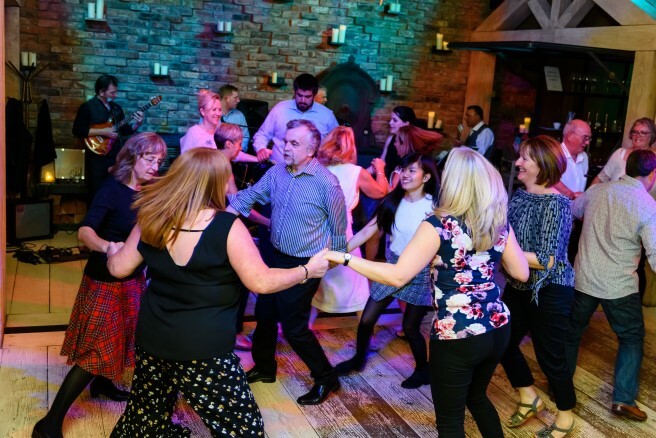 The Cutting Edge Ceilidh Band comes with one of Scotland’s top dance callers, 6 times world Highland Dancing Champion, Deryck Mitchelson, making ceilidh dancing fun for everyone whether new to ceilidh dancing or experienced. This list, whilst not exhaustive, will give a flavour of our available repertoire. Gay Gordons, Dashing White Sergeant, Strip The WIllow, Military Two Step, Virginia Reel, Canadian Bar Dance, Scottish Waltz, Eightsome Reel, Eva Three Step, Broons Reel, St. Bernards Waltz, Britannia Two Step, Swedish Masquerade, Reel of the 51st, Posties Jig, Flying Scotsman, Circassion Circle, Pride of Erin Waltz. Cutting Edge Ceilidh Band has been entertaining guests for over 25 years with our unrivaled mixture of rockin’ ceilidh and covers. Strip the Willow, Kings of Leon, Virginia Reel, Snow Patrol – no other band matches our extensive set-list. Make your special night one to remember with the Cutting Edge Ceilidh Band. Ceilidh music is at the heart of all Cutting Edge Ceilidh Band events. Student nights, fundraisers or any celebration, we play all the dances you love. Gay Gordons, Dashing White Sergeant to Eightsome Reel – everything played live and explained with one of Scotland’s top dance callers. Ceilidh has never been so much fun. We specialise in Corporate Entertainment. Background dinner music, light alfresco jazzy covers and rocky dinner dances. Cutting Edge events ooze class and sophistication. Recent customers that the Cutting Edge Ceilidh Band has entertained includes BP, Ford, ExxonMobil, Dundee and St. Andrews Universities. Having a party? 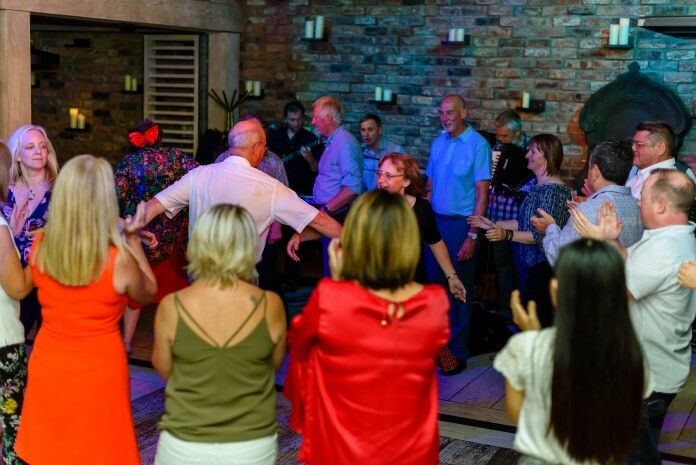 The dance floor will stay full with our special party selection of lively ceilidh dances and modern cover music from 80s and 90s to present. Guaranteed fun for everyone. The floor was full all night. Absolutely faultless! Thank you so much! Can we come and see the band? The Cutting Edge ceilidh band encourages potential customers to come and hear the band live. Where this is not possible visit the bands youtube website and view us in action. Our standard charges are for a 4 hour gig starting at 8.00 pm and finishing at 12.00 midnight, with a minimum 30 min break. Can I arrange a late finish after midnight? The band where possible will accommodate all prior requests to finish after midnight. There will be an additional charge for late finishes which will be agreed up front before playing commences. The band will arrive 45 minutes before we are due to start playing. Will you call the ceilidh dances? The Cutting Edge is uniquely placed in that it’s keyboard player is a qualified dance teacher. He ensures that all ceilidh dances are explained in a fun and easy to learn way – ensuring the success of your night. Will you learn a first dance for us? Just give us plenty of notice and we will learn most dance requests. Where this is not possible we can arrange for it to be played through our PA on an iPod. Can you supply music during the break? We have worked with one of Dundee’s top DJs to put together a set of music relevant for playing at weddings and corporate events via a laptop or iPod. Alternatively bring your own iPod along and we will connect it up. What happens if one of the band is ill? The Cutting Edge has 5 core band members. Where one is ill we always bring along a replacement of at least the same musical standard – someone who has played with the band previously. We have lighting devices that are sufficient for most venues. A larger lighting rig can be organised at an additional cost if required. What is the process for booking the band? All bookings are by contract with a deposit required at the time of booking.